I've had this recipe starred in my google reader for a while now. I needed something easy for grilled chicken the other day, and this fit the bill! It certainly helped that I happened to have a bunch of fresh cilantro in the fridge waiting to be used. I only marinated it for a few hours instead of overnight, and it still turned out GREAT with tons of flavor! We loved it and will certainly be making it again! From The Deen Bros. Cookbook - Recipes from the Road, seen on My Baking Heart. Finely grate the zest and squeeze the juice from the limes. In a blender, combine the zest and juice with remaining marinade ingredients. Puree until smooth. Pour marinade over chicken and toss to coat. Cover with plastic wrap and refrigerate overnight. Round Up: Platinum Chef Challenge 8! I must apologize for the delay in getting the round-up together. I have no real excuse other than I forgot! This round of the Platinum Chef Challenge had us creating dishes tofu, eggplant, olives, plums and oats. (You can see mine here.) We had three great entries, and as host of this round I get to select the next host. First up, we have Cara of Cara's Cravings. I think of Cara as incredibly creative and talented in the kitchen, so I was excited to see that tofu was a new ingredient in her own cooking. Taking inspiration from a favorite seafood dish, she created a mouthwatering Pan-roasted Tofu with Capers, Tomatoes and Olives. The flavor combination here sounds amazing! For the remaining ingredients, Cara devised what seems to be one of her favorite healthy-meal tricks - turning vegetables into fries! 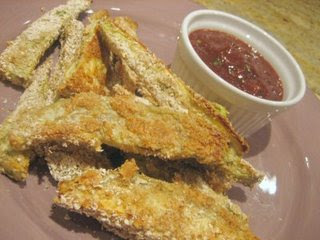 Her Eggplant Fries with Sweet and Spicy Plum Sauce look just like huge steak fries, and the sauce sounds wonderful. Next we have Catherine of Fresh From Cate's Kitchen. This was her first time participating in Platinum Chef and we are so glad to have her! 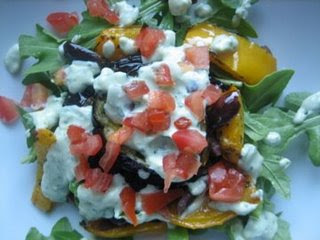 Cate created a wonderful looking Herbed Eggplant Salad with Creamy Garlic Dressing. I've never ventured farther than vinaigrettes when it comes to homemade salad dressing, so her use of tofu to create a healthy version of a creamy dressing is genius to me! This looks so good, I'm ready to dig right in! For her second recipe, Cate went straight to my heart - I love all things frozen! And let's be honest, a little alcohol makes it that much more enticing! Her Plum and Port Sorbet in Oatmeal-Almond Buttercrunch Cups are SO cute! That sorbet recipe is so simple and looks so good - I can't wait to try it! The cups sound like a very versatile base for adorable little desserts. For her second recipe, Lisa chose a Rustic Plum Tart with Ricotta Cheese and Crumb Topping. I love the additions of the ricotta and topping to a traditional simple fruit galette. It really looks like it gives the tart some substance, and what could be better than a cream cheese pie crust! This was a VERY tough decision, but I have chosen Lisa of Lime in the Coconut as the winner of Round 8! I just can't stop staring at that surf and turf - it looks amazing! Congratulations Lisa! Look for the next round appearing in her blog soon. I made this dish as a part of the new No Rules cooking group, Dinner Divas. This recipe pick instantly appealed to me, as it was selected from Cooking Light. I loved everything about this recipe - it was quick and easy to throw together, and very flavorful! I served it with white rice (for my husband) and steamed snow peas and broccoli. Yum! So this week's recipe pick came from... me! I look to these blogging events as a way to challenge myself in the kitchen, hopefully doing new things and learning new skills. When I started looking for recipes, I knew I wanted something with chicken (as my husband doesn't eat pork or red meat, so we are always looking for new ways to serve chicken). I came across this recipe and pretty much stopped looking! I had never butterflied or deboned a whole chicken before, so I definitely would be setting up a challenge. As an added bonus, I have an overgrown rosemary plant on our balcony and this was a great way to use some up! First, I needed to learn how to debone and butterfly a chicken. I went off to youtube, where I found plenty of deboning videos and plenty of butterflied videos, but none that showed how to debone AND butterfly while keeping the remainder intact. This site here described it with a few pictures, but that was definitely not good enough for my novice hands. With enough googling I eventually found a decent video, enough to get my started (regretfully, it seems I did not bookmark it and I can't find it again). No, it isn't the prettiest butterflied chicken (please try not to laugh), but I was dang proud of myself! I wasn't quite sure what to do with those legs, though. Cut them open? Probably. I just left them as is. I added the rub and wrapped it up. Hot off the grill... I swear these are the best grill marks I've ever made! We served atop a salad. YUM! I hope everyone that got to make it enjoyed it. We certainly did. Check out the other Barefoot Bloggers here! I made this as a part of Dinner Divas (though I am apparently a little late). I am *always* looking for new burger ideas, as we don't eat red meat and grilled chicken gets a little old after a while! Though the burgers themselves were barely seasoned, the combination of all the other flavors was great! I will definitely keep this recipe around. :-) One word of caution... these are TALL! I handed them to my husband and said, "good luck!" For the burgers: Heat the grill to medium. Place the strips of bacon on the grill (lay them across the grate so they don't fall through) and grill for 3 to 4 minutes on each side, until golden brown and slightly crispy. Remove the bacon to a plate lined with paper towels. Increase the heat of the grill to high. Form the meat into 4 (8-ounce) burgers, brush with the oil and season with salt and pepper on both sides. Grill the burgers until golden brown on both sides and cooked completely through, about 5 minutes per side. Top the burgers with the blue cheese, close the cover, and continue cooking until the cheese begins to melt, about 1 minute longer. Place the burgers on the bottom half of each bun and top with a slice of tomato, 2 slices of avocado, 2 slices of bacon and some of the dressed romaine. Cover each burger with the bun tops and serve. For the vinaigrette: Whisk together the vinegar, lemon juice, mustard, Worcestershire, garlic, sugar, salt, pepper and oil in a small bowl. Cover and refrigerate for at least 30 minutes before using to allow the flavors to meld. Just before assembling the burgers, place the romaine in a medium bowl and toss with the vinaigrette. I had SO much fun making this! Maybe it's my love for ice cream, or cool looking desserts, but I had noooo problem with the waiting game that some people weren't crazy about. I loved making my layers! Of course, I loved digging in even more, so the pictures were quick and therefore not so stellar. I didn't bother re-freezing it after the unmolding, so it got a little messy. My chocolate layers really started to melt down. I halved the recipe and filled 3 (7 oz) ramekins with plenty of ice cream and ganache leftover. I used the saran warp method, which resulted in less than desirable wrinkling, but the parchment paper was not playing nice that day. I used my homemade vanilla ice cream, combined with mixed berries instead of just raspberries. My ice cream is designed to be lower in fat, and I think that contributed to the crystallization from all the freeze-thawing that took place. For the best texture, you really need a full fat ice cream. Taste-wise, this can't be beat. The strawberries really came through in the ice cream, and the ganache was like a great hot fudge. Next time, I think mint ice cream would be great in this! YUM! Chosen by Amy of Food, Family and Fun. As promised, I played around with the idea of making cherry sour cream ice cream. It took a few trials to get right, because I decided... what would be better than cherry sour cream ice cream? Cherry LIMEADE Sour Cream Ice Cream! The amount of lime juice/zest took some tweaking, but thanks to the goddess, I got it figured out. Adapted from Blueberry Sour Cream Ice Cream, Baking: From My Home To Yours by Dorie Greenspan. Put the cherries, sugar, salt and lime zest and juice into a medium nonreactive saucepan and cook over medium heat, stirring, until mixture boils and the cherries soften, about 4 minutes. Turn the cherries into a blender and whir until you have a fairly homogeneous puree, about one minute. (It will never be completely smooth, and that's just fine.) Add the heavy cream and sour cream and pulse just to blend. Pour the custard into a bowl and refrigerate until it is chilled before churning it into ice cream. (I recommend at least 4 hours) Scrape the chilled custard into the bowl of an ice cream maker and churn according to the manufacturer's instructions. Pack the ice cream into a container and freeze for at least 2 hours, until it is firm enough to scoop. As I mentioned, my parents were just here visiting and I had made some blueberry muffins for them. My mom mentioned that she had the recipe from Jordan Marsh... a recipe for which they were famous. Of course I told her to send it to me, and of course I used the leftover blueberries to make the Jordan Marsh recipe as soon as I had time! Despite the fact that I just didn't bring my A-game to the kitchen that day and they don't *look* spectacular.... they certainly do *taste* spectacular! I planned to take just a bite of one, as I had already had breakfast, but couldn't help but to eat the whole thing! If you are in the market for blueberry muffins, this recipe, at the very least, deserves to be on the short list! Preheat oven to 375 degrees. Grease well muffin pans (bottom and top). In large bowl, cream butter with sugar until light and fluffy. Add eggs one at a time, beating after each addition until well blended. Sift flour with baking powder and salt. Then add flour mixture to butter/egg/sugar mixture alternately with milk, beating by hand just until combined. With a fork, mash ½ cup blueberries and add into mixture. Add rest of blueberries, mixing in gently. Fill muffin cups about 3/4 full and sprinkle with sugar. Bake 25-30 minutes or until lightly browned. Let cool in pans about 1/2 hour before removing. My parents were visiting us for a long weekend, and my Dad's garden is notorious for overproducing tomatoes, cucumbers and zucchini. Much to my surprise (as they spent 4 days driving out to our place), he brought some zucchini and cucumbers for us to enjoy. I decided to take advantage of the larger zucchini (they ones in the store are so tiny!) and make stuffed zucchini. A friend had sent me a recipe that I struggled to find (unsuccessfully), so I turned to google. Heat olive oil in heavy frying pan and saute chopped onions and peppers until they are just starting to soften, about 5 minutes. (They will cook more in the oven, so they don't need to be fully cooked at this point.) Remove onions and peppers to large mixing bowl, then add ground beef to hot pan and cook until starting to brown. When meat is about half cooked, season with Spike Seasoning and ground fennel and add garlic, and continue to cook until meat is well browned, breaking it into small pieces with the side of your turner. Remove cooked ground beef to mixing bowl. Add cooked brown rice, chopped basil, parmesan cheese, and chicken stock to meat and vegetable mixture, and gently combine. Choose a roasting pan with slight sides, just big enough to hold the zucchini. Spray pan with nonstick spray or a light misting of olive oil. Stuff zucchini with stuffing mixture, packing in as much as you can into each zucchini, and mounding it up as high as you can, until all stuffing is used. Put zucchini into roasting pan, putting them close together so they hold each other stuffing-side up. Roast uncovered 20-30 minutes, until zucchini is tender-crisp, and filling is hot and slightly browned. Serve hot. This will keep well for a few days in the refrigerator and can be reheated in the microwave. ...very soon... you will be MINE! Chosen by Michelle of Bad Girl Baking. 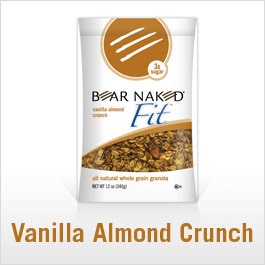 Combine protein powder, oats, flax seed and wheat germ in a large bowl, stir with a wooden spoon until mixed. Add peanut butter and milk, and stir with spoon or mix with hands (messy, but the most effective method!) until thoroughly combined. Add additional milk as necessary to bring all ingredients together. Line a 9x13 pan with parchement paper. Press mixture into the pan evenly. Place pan in the freezer until bars are set. Remove from pan using parchement paper, then peel the paper off. Cut into 20 regular bars or 16 large bars. Calories - 290. Total Fat - 11g. Sat. Fat - 2.1g. Carbohydrates - 29g. Fiber - 4.5g. Sugar - 4.4g. Protein - 22g. Panzanella is a bread salad. I had never even heard of it before, but it definitely sounded interesting! My parents were visiting last weekend, and it turned out to be the perfect light lunch before we headed south for a Cubs game. I made the full recipe, and it was great for 4 adults. I only used 1/2 to 2/3 of the dressing, though, as I didn't want it saturated in oil. We all thought it was great! It came together very quickly, I can definitely see us having it again! See the other Barefoot Bloggers here. For the vinaigrette, whisk all the ingredients together. In a large bowl, mix the tomatoes, cucumber, red pepper, yellow pepper, red onion, basil, and capers. Add the bread cubes and toss with the vinaigrette. Season liberally with salt and pepper. Serve, or allow the salad to sit for about half an hour for the flavors to blend. I sorta feel like I am cheating a bit here. I made this over a month ago and just never posted about it. I have all intentions of either making it again tonight or making cherry sour cream ice cream tonight... so hopefully you'll see the latter (if I make it) tomorrow. I really liked this ice cream, despite my probably going overboard with the sour cream. It was very pronounced for me. I will definitely be measuring more carefully in the future! Chosen by Dolores of Chronicles in Culinary Curiosity. Today I present my entries for Platinum Chef Challenge #8: Plum Squares and Roasted Eggplant with Tofu and Olives. I really enjoyed hosting this round, be sure to look for a wrap up of all the great entries towards the end of the week! I tried a few different ideas that kind of flopped, and eventually found two great recipes that I was very happy with. The plum squares turned out a little different than I was expecting, but I was really proud of my first attempt at making fruit preserves. They were so good! I chose eggplant as an ingredient because I had never cooked with it before. I had a great time experimenting with it! The final dish came together with great flavor and would be great with either rice (as I served it) or pasta. Dice the eggplant into 1" cubes. Place in a colander in the sink and salt well. Let drain for one hour, then rinse the eggplant well and dry by pressing between paper towels. Prepare a pan (jelly roll works fine) with a little olive oil or cooking spray. Place eggplant on pan in a single layer and roast at 350 degrees F for about 30 minutes, until golden. When eggplant is done, heat olive oil in a large pan. Saute garlic and onions 1-2 minutes, until onion softens. 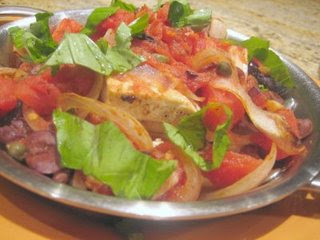 Add tofu, olives, sundried tomatoes, and artichokes to the pan and cook 3-4 minutes, stirring frequently. Add white wine, allow to reduce by half. Add chicken broth and spices, allow to reduce by half, stirring to coat other ingredients. Add eggplant and toss to coat and heat the eggplant through. Add lemon juice, toss to combine. Service over rice or pasta. To make the plum preserves: Wash and pitt the plums and cherries. Quarter the plums and halve the cherries. Combine with other ingredients in a saucepan and cook for about 45 minutes, until fruit is soft. Blend into a puree with a blender, food processor, or immersion blender. Set aside to cool slightly. To make the squares: Make the bottom crust by combining the flour, oats, brown sugar, sugar, cinnamon, nutmeg, baking soda and salt in a bowl. Whisk to mix thoroughly. Cut the butter into the dry ingredients using a pastry cutter, until there are pea sized bits. (Alternately, use a food processor). Press into an 8x8 pan that has been prepared with a baking spray or lined with parchment paper. Bake at 350F for about 20 minutes. Meanwhile, prepare the top crust. Combine the oats, brown sugar, flour, cinnamon, and nutmeg in a bowl. Cut the butter into the dry ingredients using a pastry cutter, until there are pea sized bits. (Alternately, use a food processor). When the bottom crust is done, spread the plum preserves over the bottom crust. Sprinkle the top crust over the plum preserves. Place back in the oven for 30 minutes more. Cool in the pan on a wire rack. Cut squares once fully cool. This week's recipe was a Black and White Banana Loaf. I had lots of fun trying to make a nice marble without actually reading any of the marbling techniques. ;-) I think they still turned out pretty good. My loaf was quite dense, and I almost forgot it was going to be chocolately when I bit into it. The chocolate was very subtle for me (I used semi-sweet), so being a non-chocolate lover, I really liked that. I served it to friends who loved it, and one even was able to pick out the run flavor. 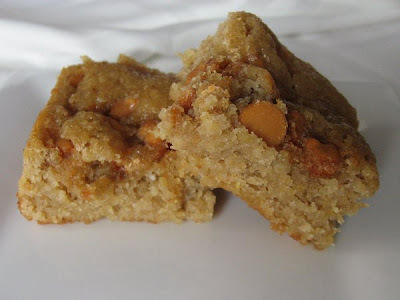 Cara shared a recipe for blondies by Marc Bittman, indicating some substitutions she made to make it a bit more healthy. I set out to try them, but along the way made a number of substitutions myself! I decided that chocolate brownies shouldn't be having all the fun, so I wanted to make blondies that incorporated some white beans (I picked on the can on navy beans in the cupboard). I then subbed out some of the AP flour for ground oats. I also included some of my usual subs - unsweetened applesauce for oil (though here I guess it is replacing butter - thanks to Cara for trying out this particular substitution! ), and wheat germ for more of the flour. The end result, while very tasty, was slightly more fluffy than I wanted... it wasn't quite as dense as I expected, and therefore, I'm not quite sure if it is really a blondie. It's a cross between a blondie and cake. Whatever you end up calling them, they sure are good! And NO, you can't taste the beans! Combine butter, brown sugar, and pureed navy beans, beat until smooth in a stand mixer or with a hand mixer. Beat in applesauce, then egg, the vanilla, incorporating each before adding the next. In a separate bowl, combine ground oats, flour, wheat germ, baking powder, and salt. Whisk to mix together. Add dry ingredients to wet ingredients, mixing with a spoon just until combined. Pour batter into an 8x8 pan that has been lined with parchment paper or sprayed with a baking spray such as Baker's Joy. Top with butterscotch chips. Bake at 350 for 20-25 min, or until a toothpick inserted in the center comes out with a few crumbs attached. Allow to cool on a wire rack in the pan. Cut into 16 pieces once fully cooled.